Hedda is a dangerously irresistible woman. She lives a highly respectable life with her reputable husband, George, in her perfectly run home- but is this enough? To relieve the boredom of respectability she turns to the lives of others for pleasure and excitement, determined to be a woman of consequence, whatever the consequences. It soon becomes apparent that Hedda is in a loveless marriage, but when George’s academic and handsome rival turns up, their lives are thrown into disarray as passion and desperation embrace all those who have fallen under Hedda’s fatal spell. Through gentle domestic humour and high tension, this story leads to its thrillingly unexpected climax. Ibsen’s masterpiece of a woman’s desire for freedom is still as fresh and shocking as when it was first performed. The many productions translated all over the world are testimony to the enduring popularity of this powerful story. 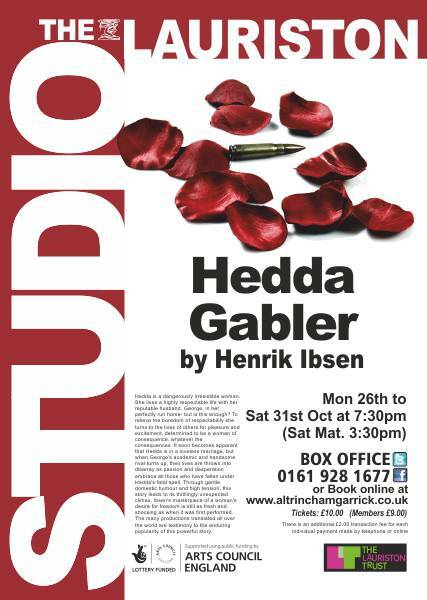 Had Henrik Ibsen?s Hedda Gabler lived in the 21 century rather than the 19th, she might have been a more well-balanced individual. ?As it is she is trapped in her recent marriage to a tedious academic whom she doesn?t love. ?To the outside world she seems sociable enough but beneath her affable surface is a whirlpool of torment and intrigue. ?As well as feeling trapped and isolated, Hedda is subjected to sexual blackmail by Judge Brack, a randy Mark Edgar. ?Saira Mian plays the enigmatic and tragic Hedda exactly as she describes in the programme ? icy and taunting, beguiling, teasing and provocative. 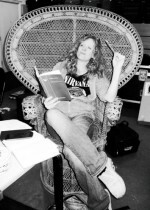 ?She plays this complex character with insight into the effect that utter boredom and dislike of husband George (Bryn Thomas)) has wrought on her psychologically, indirectly leading to the tragic and unforgettable last scene. ?I like Bryn Thomas?s interpretation of the loveless husband whose character only shows emotion after his wife has committed a shocking act against the would-be author. ?It is an emotion, not of anger, but of glee that he interprets it as meaning Hedda loves him. ?Hedda?s former schoolfriend, Thea Elvsted (a feisty Kate Millington) couldn?t be more different as she shows early indications of sexual freedom. ?We gather that she would think little of casting aside the spouse she has already left, to team up with Eilert Lovborg (Scott Ransome) )as they work together on his book. ?The book is so precious to him that Eilert calls it his child. When that child seems to exist no longer, he, too, no longer wishes to exist. ?And it is all due to the scheming of Hedda that he should be in that position. ?I like the way the playwright slowly builds up the tension. ?Also, Mike Shaw and his team are to be congratulated on the colourful and authentic Victorian costumes. After many years of reviewing, this is the first time I have seen this classic. The Garrick brings it to life and I congratulate them on having the courage to put it on.